- In the editor, put water around an island. 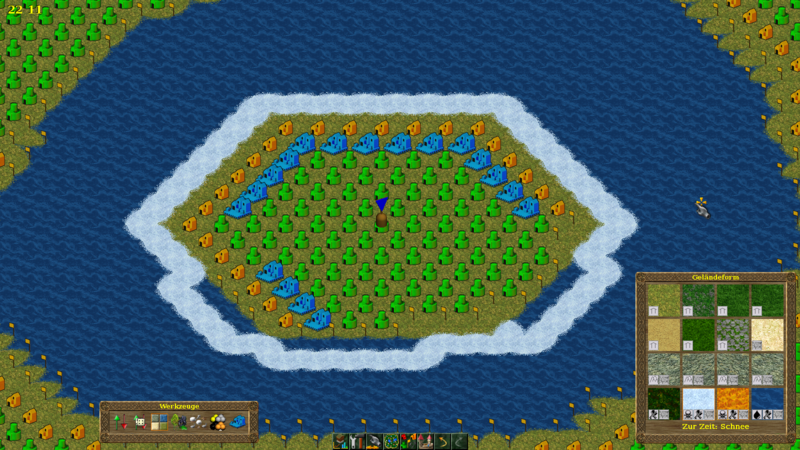 The island should be hexagonal. - Set port spaces everywhere where this is possible. They form a hexagon, too. - Put some other terrain type instead of water around the island (I took snow, but other ones work too). Expected result: The port spaces vanish since a port cannot be built any more. Actual result: Only some port spaces vanish (see screenshot). If you click now on the height tool (for example), the icons get updated and all port spaces vanish. New ones cannot be placed. If you remove the snow, the port spaces reappear (after another forced refresh). If you save the map, you cannot build ports on such "wrong" port spaces. The same issue has been reported by einstein13 in our forum (https://wl.widelands.org/forum/topic/1005/?page=1#post-9659, the second, edited part), therefore setting to confirmed. Seems like a minor nuisance. nothing for b18. Setting to incomplete for bug sweeping.